We were giddy when we realized we could spend the better part of a week in Washington, D.C. We’d only ever been with kids or as kids ourselves. We were long overdue for an opportunity to experience our nation’s capital as adults with no real responsibilities for anyone else! We camped at the Cherry Hill Park Campground, in College Park MD. If you’re coming this way in an RV, we highly recommend it. It’s the nicest place we’ve stayed so far, and by no means the most expensive. The Metro bus comes right to the campground and it’s a quick ride to the train station. And then just a 20-25 minute ride into the heart of D.C. It was SO easy to navigate. And… the campground has single-stream recycling! 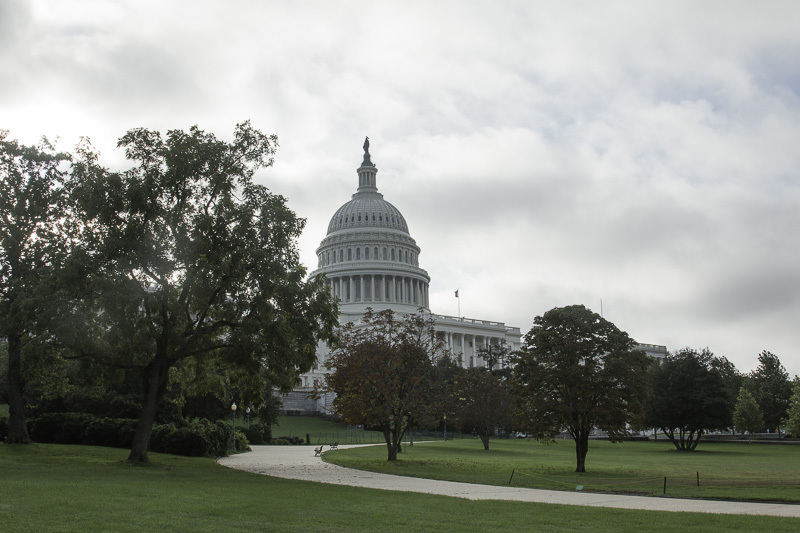 Each day at 4 PM, the campground offers a great orientation to the D.C. transportation system and an intro to two tours—we signed up for both. Terrific. A week in Washington Is not nearly enough! We didn’t have even that much time, but we had a wonderful time. We went into the city four times; twice on our own and twice as part of the tours organized by the campground. The first day we were there, we went into the city on our own and split up. 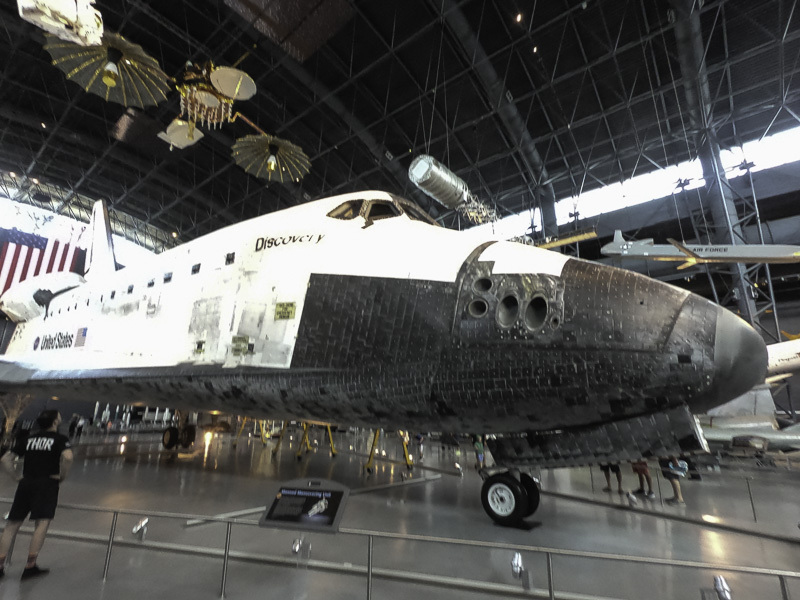 I (Al) went to the Steven F. Udvar-Hazy Center of the Smithsonian’s Air and Space museum near Dulles Airport. 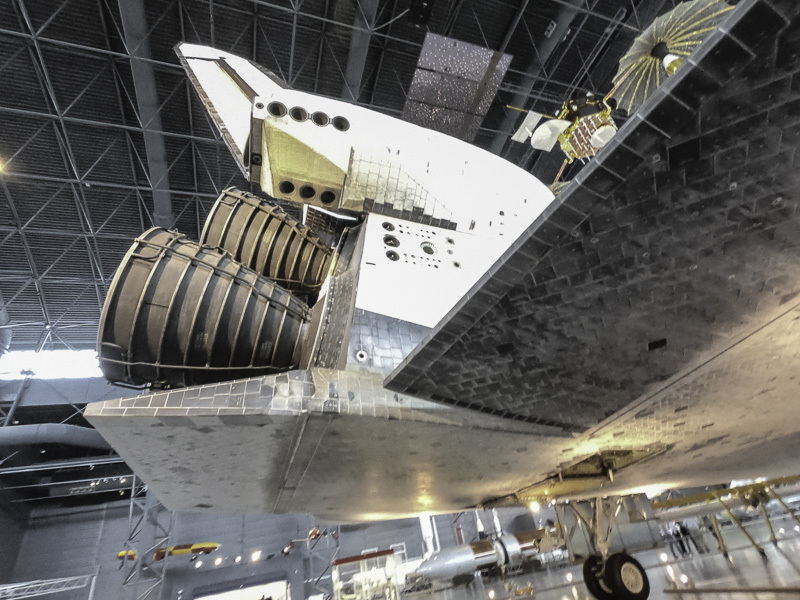 If you are into the history of aviation and space exploration at all, this is a must see. 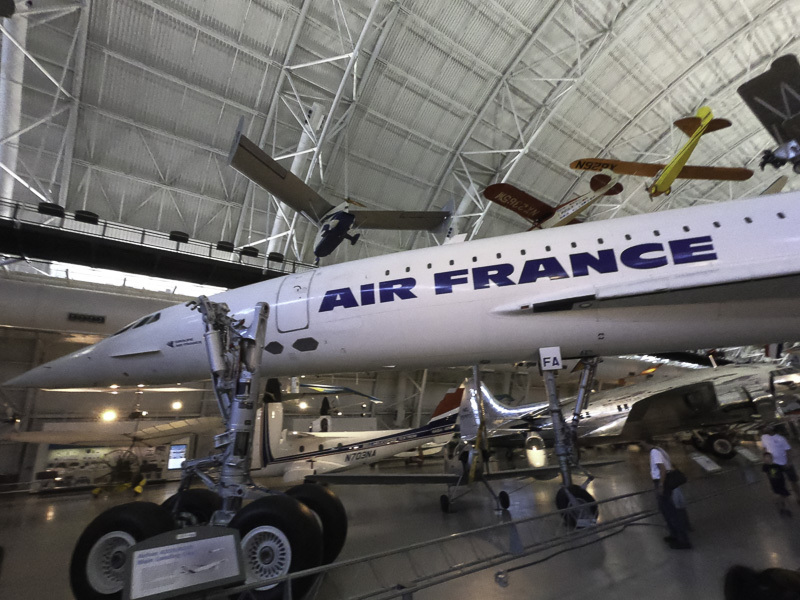 The museum is in a huge hangar, and has a wide range of planes and space craft from very early days to recent history. Main displays include a Concorde SST, an SR-71 (the fastest—2000 MPH—and highest flying—80,000 ft—jet ever built — 32 were built in all), the space shuttle Discovery, and the Enola Gay. 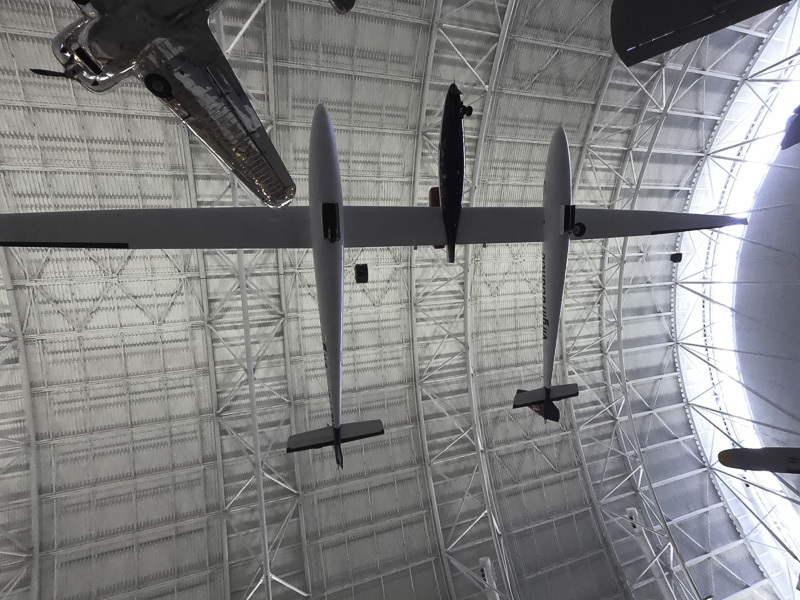 Beside those four, there are aircraft and space craft densely packed in the hanger, in three layers: one on the hangar floor and two layers creatively suspended in the air from the ceiling. I spent over three hours there and only scratched the surface. The density actually is a problem in trying to get good pictures of the craft because of the visual clutter in the background. 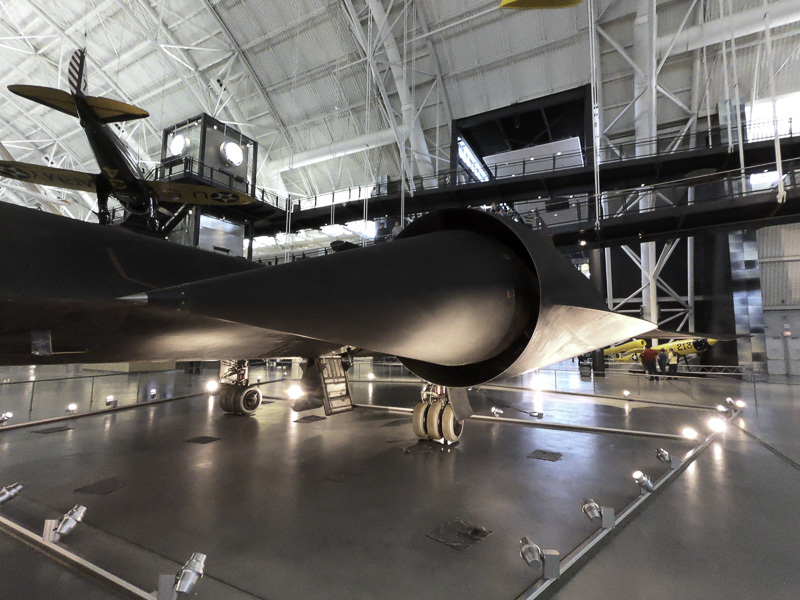 The SR-71 is very difficult to photograph in its entirety in this setting. It is huge. It is jet black (get it?). It is crowded by other craft. Here is the port engine, a marvel of slide rule engineering—it was designed in the late 50’s—early 60’s— with NO computers! 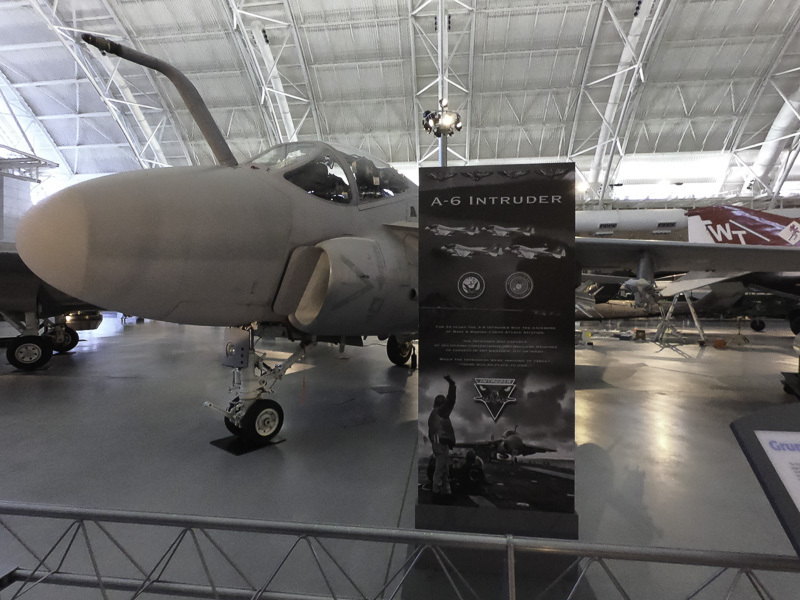 The A-6 was one of the key bombers of the Vietnam era. The Discovery has a prime place on the display floor. The engine nozzles. This thing is BIG! If I had to have an Airstream instead of our current trailer, this is the one I would want! 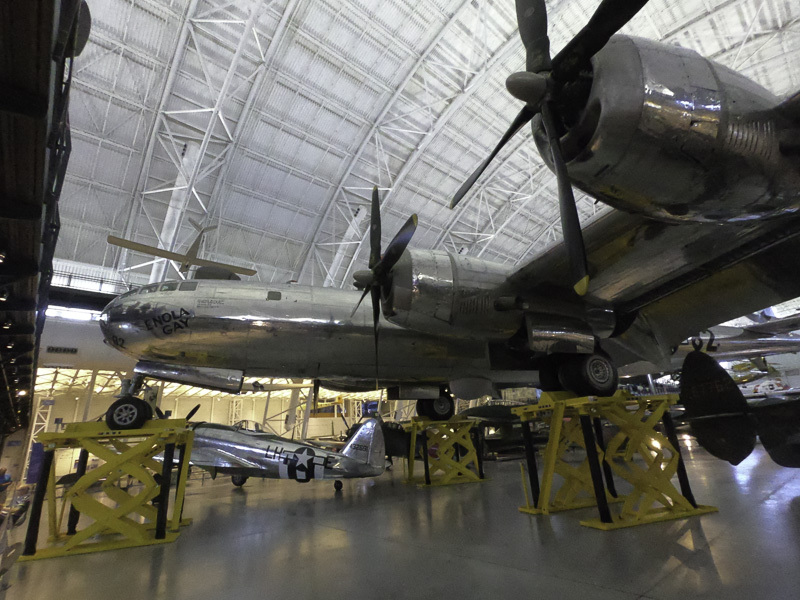 Enola Gay–it dropped the first atomic bomb , on Hiroshima. 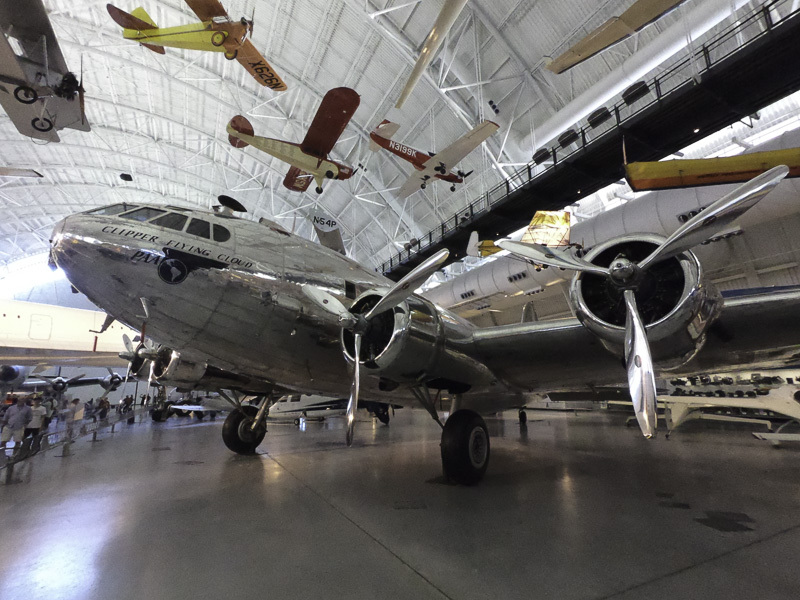 The Boeing 307 was one of the, if not the, first commercial airliners. It was based on the B-17C bomber from World War II. I wonder whether or when we’ll have another supersonic passenger plane. The Global Flyer accomplished the first solo, non-stop circumnavigation of the world. Sixty seven hours and one minute. Global Flyer . The wingspan is HUGE! 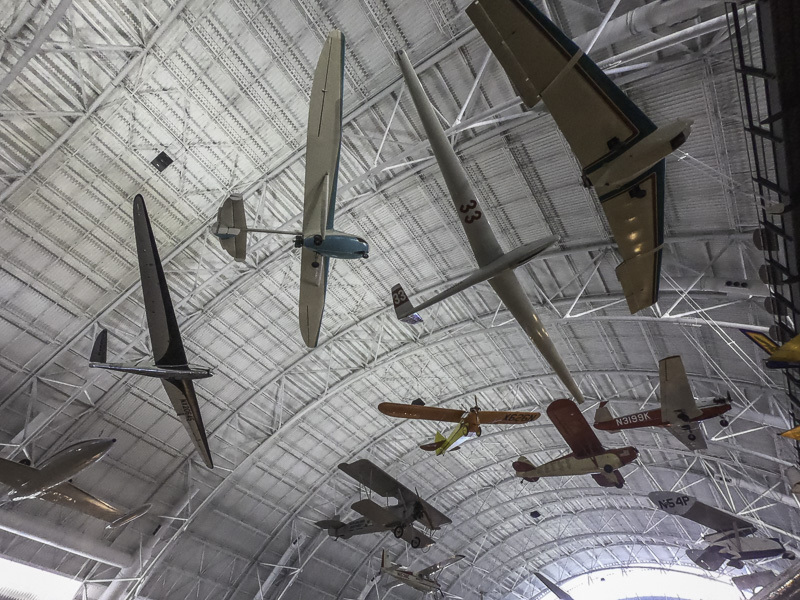 A sampling of the planes suspended from the ceiling. Too many planes to keep straight! The museum is quite a distance from downtown area, but is well worth the trip! 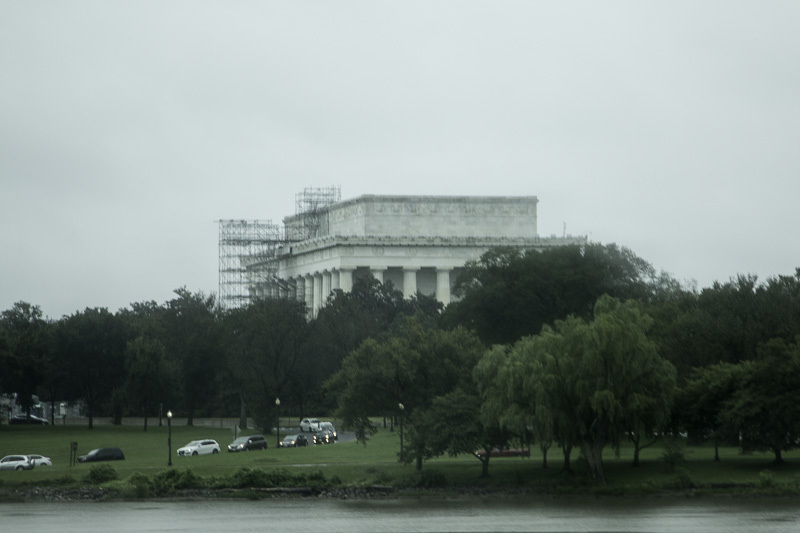 Kathe: While Al was at the museum, I visited several museums on and near the National Mall. Within just a couple of blocks of wandering, I came upon a very long queue of folks waiting to get into the Newseum. As it turned out, it was FREE MUSEUM day in D.C. I hopped into line and immediately started chatting with a couple of women. Before long I realized that even though it was a free entry day (usually $25), I still needed a ticket. One of the women I was in line with graciously offered me a second free ticket that she had. Score! 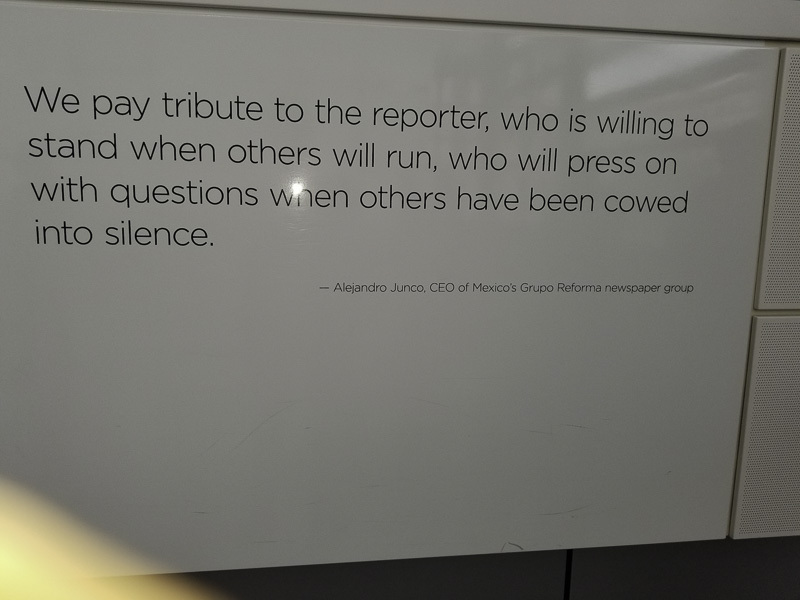 I stayed at the Newseum for two solid hours and thought my head would explode! This museum focuses on the world of journalism and promotes first amendment rights through exhibits that include (among many others): 9/11, the Berlin Wall, a special FBI exhibit, a daily display of 80 first pages of newspapers from around the US and the world, a wide range of films documenting important world events, and an extraordinary gallery of decades of Pulitzer Prize winning photos. 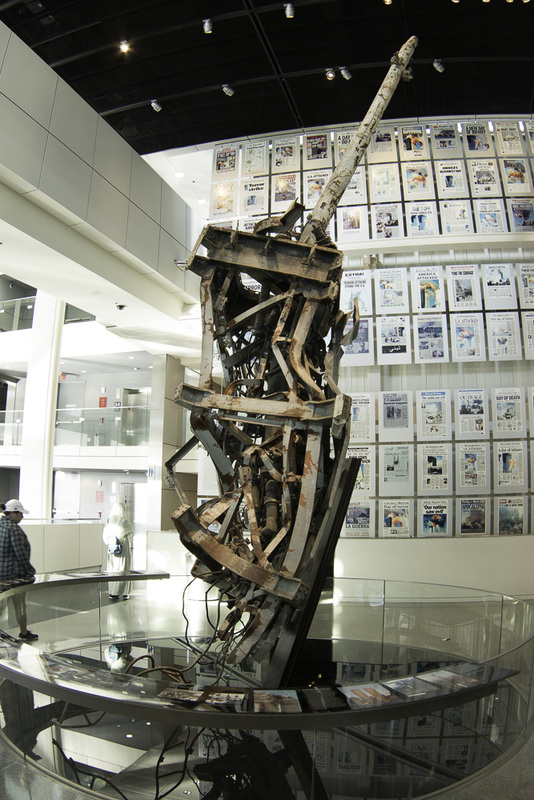 The remains of the antenna tower from the top of the World Trade Center. Front pages of international newspapers reporting on 9/11. 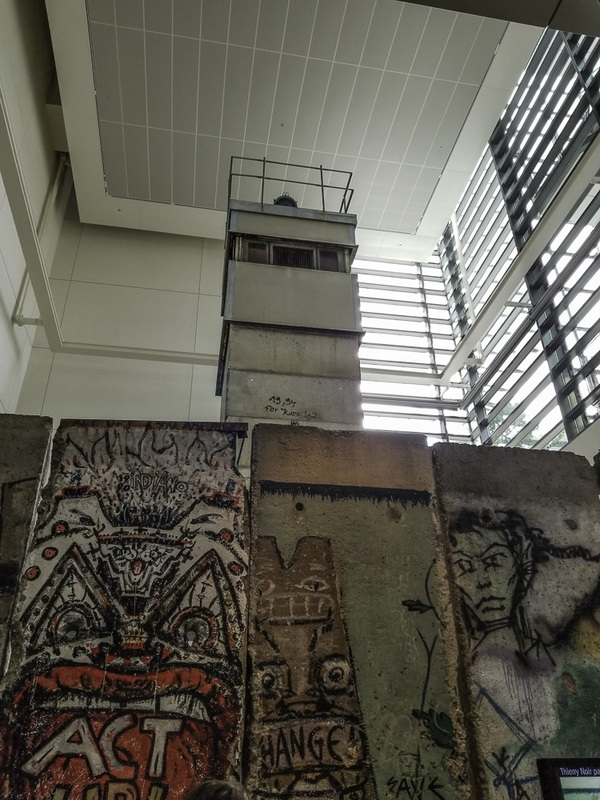 This display includes eight panels from the Berlin Wall and the guard tower from Checkpoint Charlie – extraordinary! 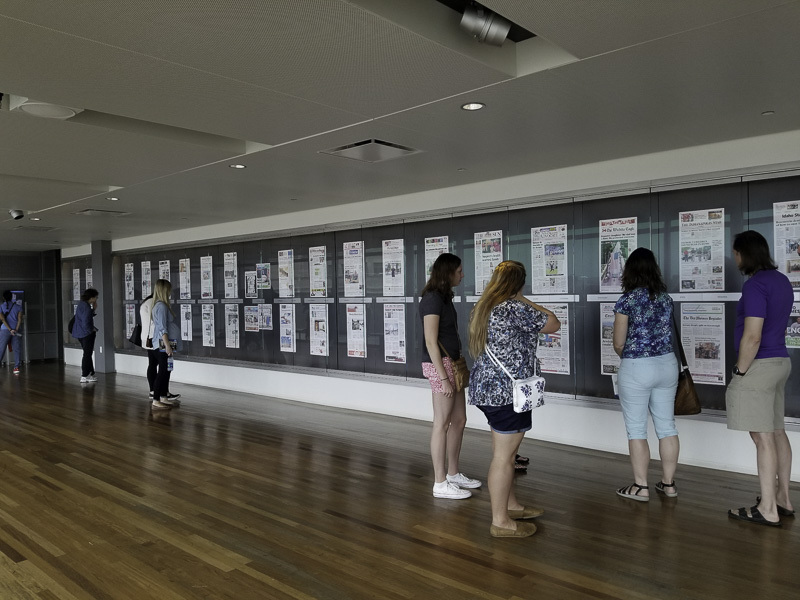 During the overnight hours, the Newseum receives copies of the front page of more than 80 newspapers. They are printed oversized and displayed – fascinating to see how the same story can be reported from so many perspectives. An important display! What is striking is that each of the exhibits includes a range of short videos by journalists who covered the story. 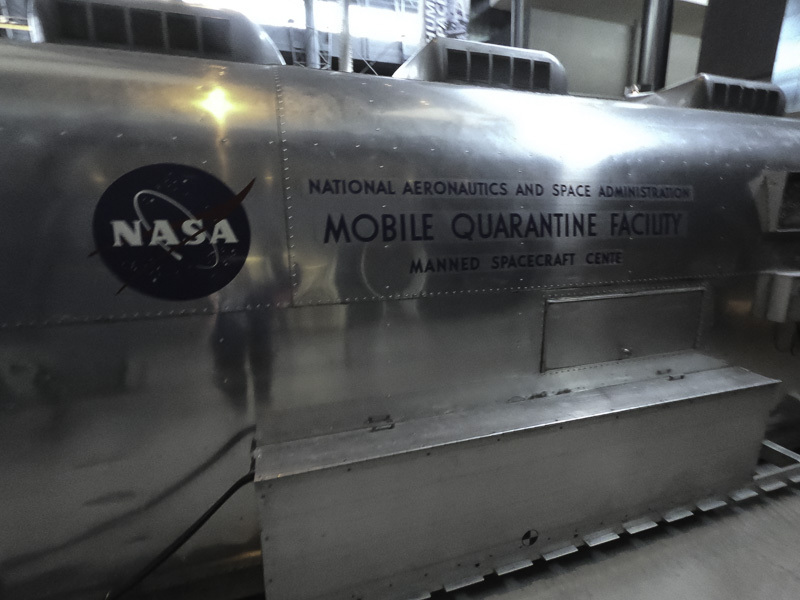 It is without a doubt the most current, dynamic, compelling, and thought-provoking museum I’ve visited; I considered suggesting that they hand out Kleenex as you come through the main door — and yes, I took Al back to it later in the week! I can’t recommend this one highly enough. 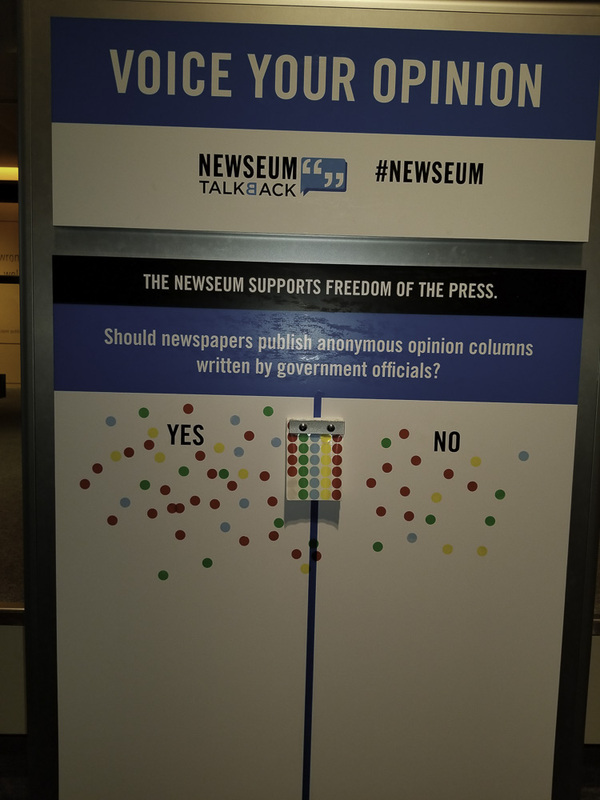 You can also make YOUR opinions known at the Newseum. The opinion poll question is always related to the current day’s news. 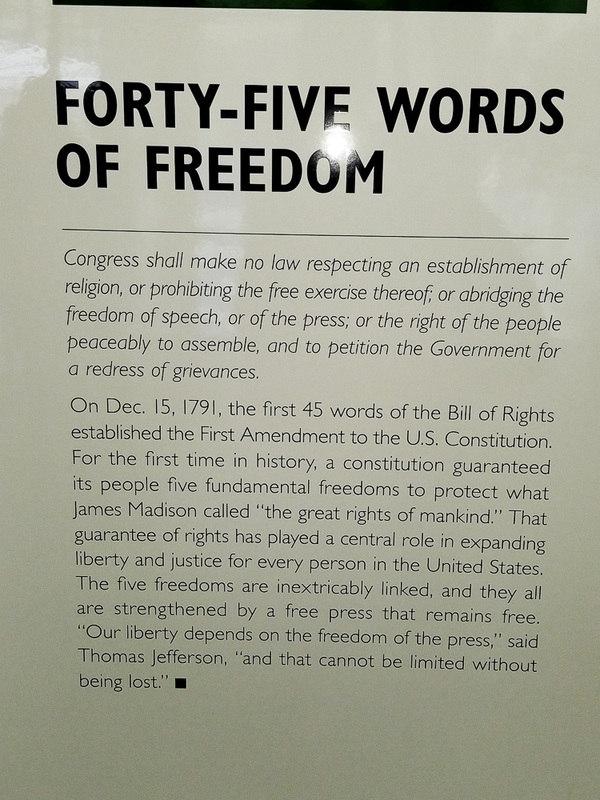 It was refreshing to reread the First Amendment. Do you know what the five rights are? 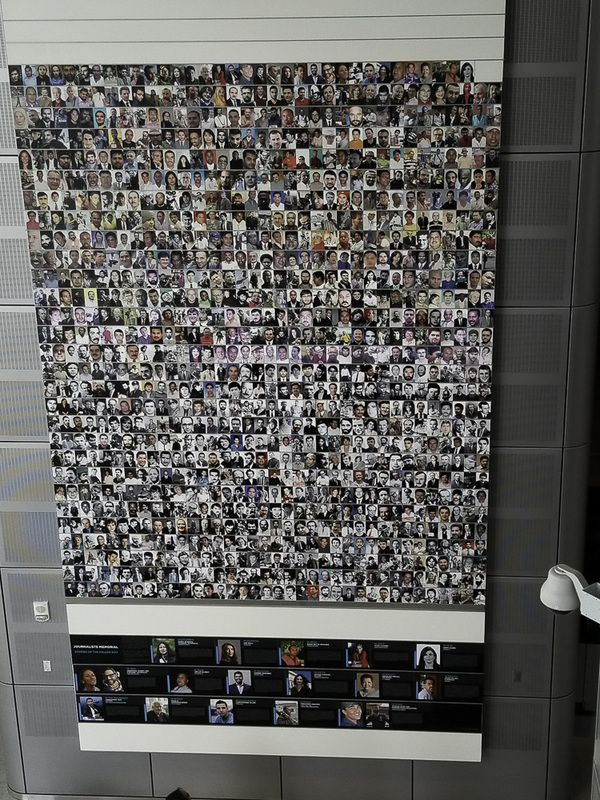 A sobering memorial (at least two stories high) of journalists who have given their lives in their pursuit of the truth. I also visited (somewhat briefly) the National Gallery of Art, the National Museum of Natural History, and the Hirshhorn Sculpture Garden. It was a whirlwind and honestly, I could have spent days upon days visiting so many more museums — alas, I needed to meet Al and we needed to figure out where we would eat dinner. Never underestimate the power of Google! We searched “Restaurants near Me” and found an Indian restaurant nearby — what a find! It turns out that Rasika is a restaurant which has won a James Beard award and we can see why. It was amazing! On the second day we took a day-long guided tour of the city with a very knowledgeable guide. 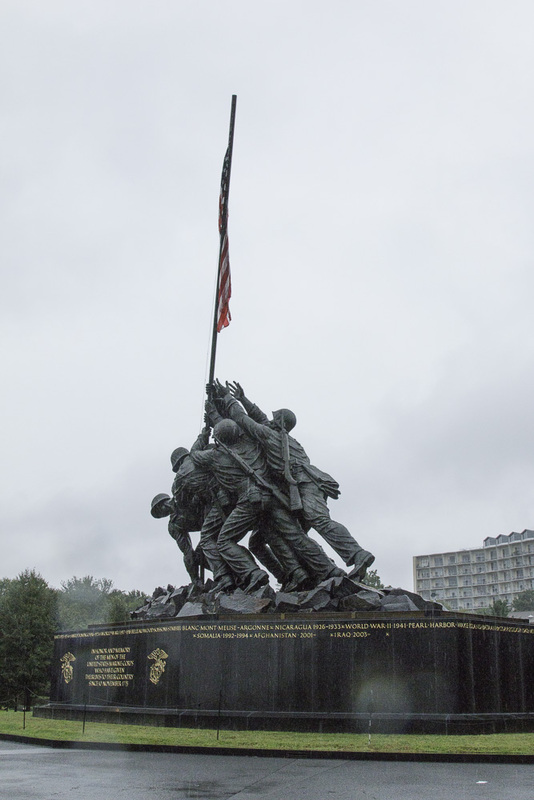 We visited the Air Force Memorial and the Marine War Memorial (also called the Iwo Jima memorial). Then we took a water taxi ride from the wharf near the Lincoln Memorial to Georgetown. We stopped at the Pentagon City Mall for lunch, and found a stand offering a wide variety of baklava squares that were imported directly from Lebanon. They were incredibly delicious and oh, so sweet. We got several and were able to make them last for several days, but it was tough. It would have been so easy to eat all of them before the end of the tour! Next we went to the Tomb of the Unknown Soldier, a very sobering place. We had both been to this site before but it was good to revisit it. We were present for the changing of the guard ceremony. The guard has been present 24/7/365 since it was initiated on April 6, 1948. The markings of so many years of the sentries’ precise steps were visible in the dark orange on the granite platform. It is an incredible honor to be chosen for this highly competitive post. There are graves for one soldier each from World War I, World War II, the Korean War, and the Vietnam War. 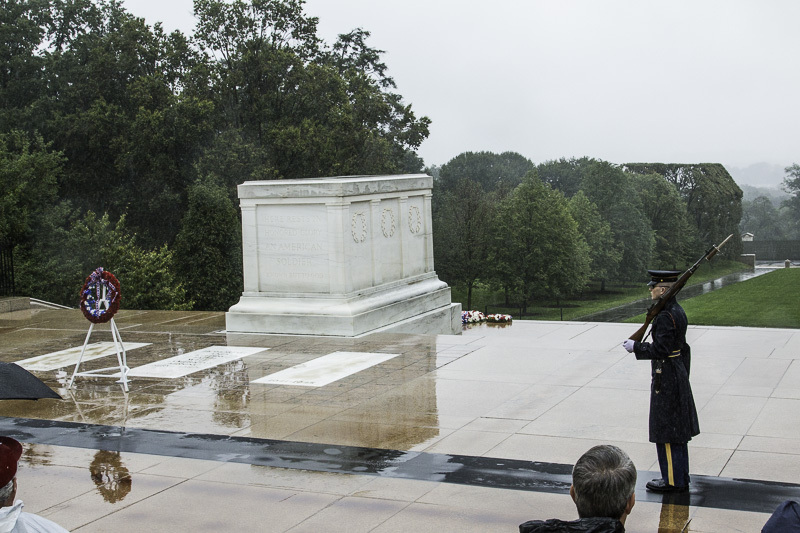 The crypt for the Vietnam War unknown soldier is now empty, as the entombed soldier was identified in 1998 as Air Force 1st Lt. Michael Joseph Blassie through mitochondrial DNA. Here is Kathe’s video of the Changing of the Guard ceremony. Since the rain had picked up and no one really wanted to get off the trolley, the tour of Arlington was a bit shorter than usual. Our tour guide asked if we would like to visit the Pentagon Memorial. Yes! Several others on the tour had already seen the NYC 9/11 Memorial and the Flight 93 National Memorial in Shanksville, PA and were eager to see this 9/11 memorial as well. 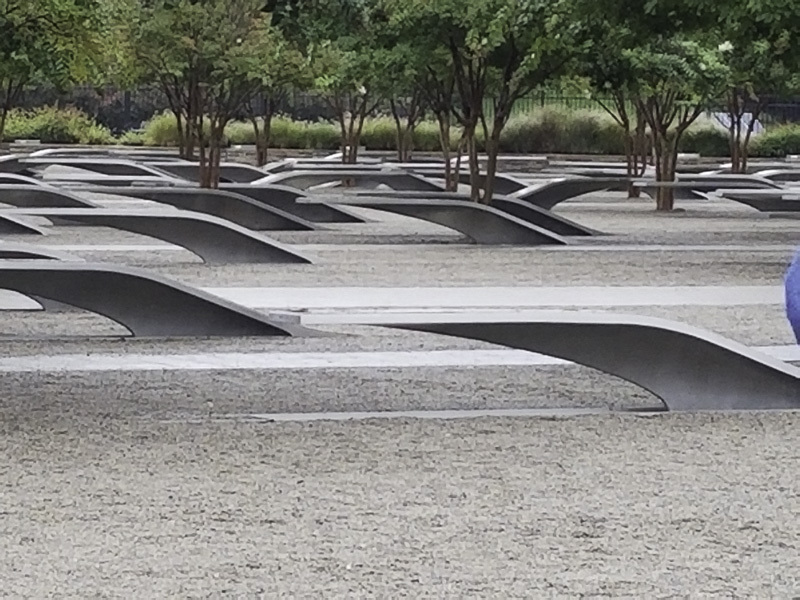 The Pentagon Memorial is breathtaking — and a feat of imagination. 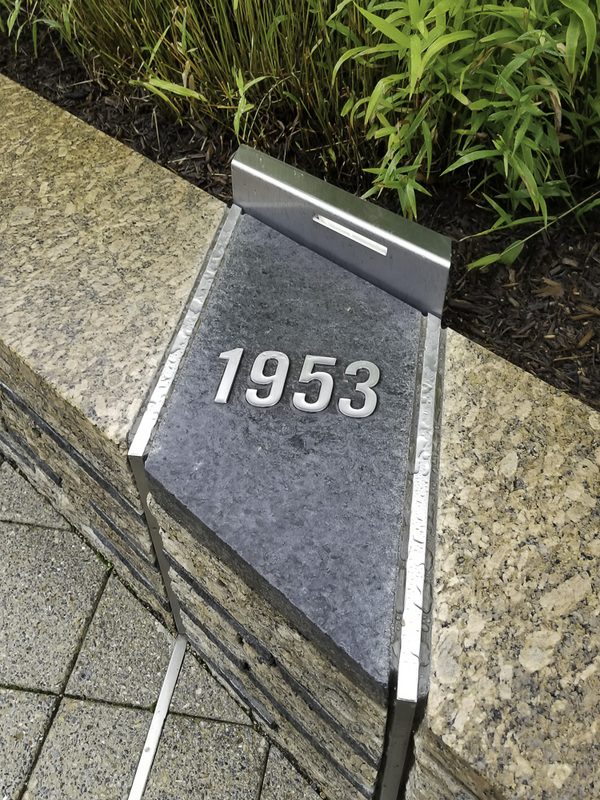 There is a stainless steel cantilevered bench inlaid with granite for each of the 184 victims with their name engraved on it. 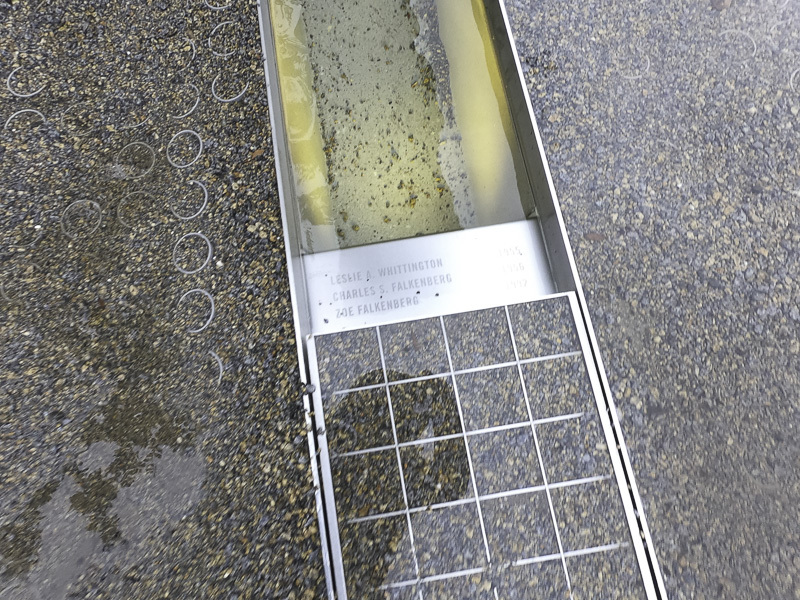 The bench has a lighted pool of water underneath which reflects light onto the gravel field at night. 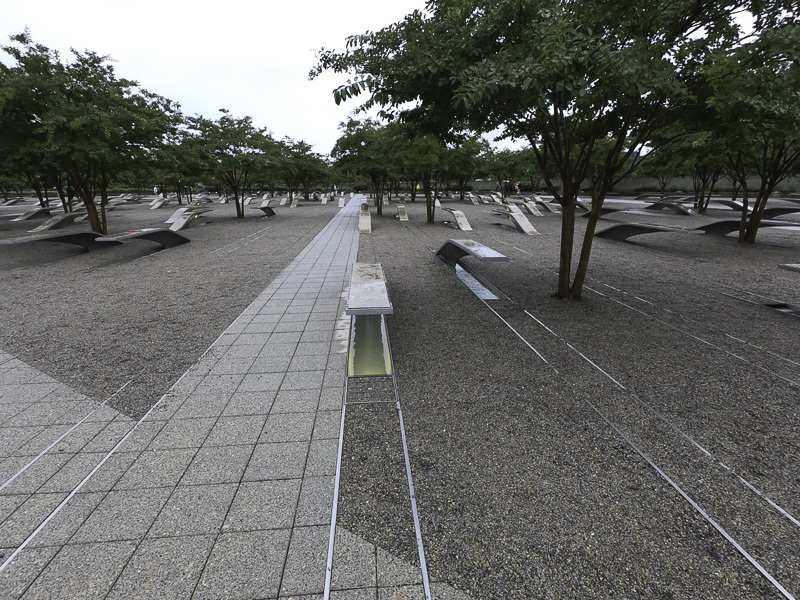 Each bench resembles an airplane wing and points one of two ways depending on if the victim worked at the Pentagon or was fated plane that crashed into the building. All of the benches for people born in the same year are arranged in a line going diagonally across the large area. 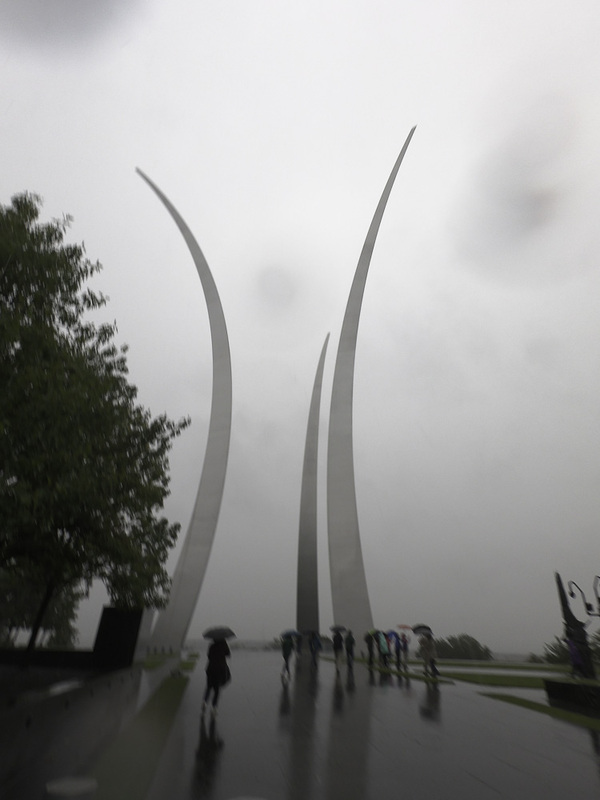 If the base points toward the Pentagon, it commemorates an employee. If the base points in the opposite direction, the victim was on the plane. The victim’s name is engraved on the edge of the bench. However, in this case, three other names and birth years are engraved below; this represents four members of the same family who were all victims aboard the hijacked plane. Commemorative benches in line with this marker represented those born in 1953. 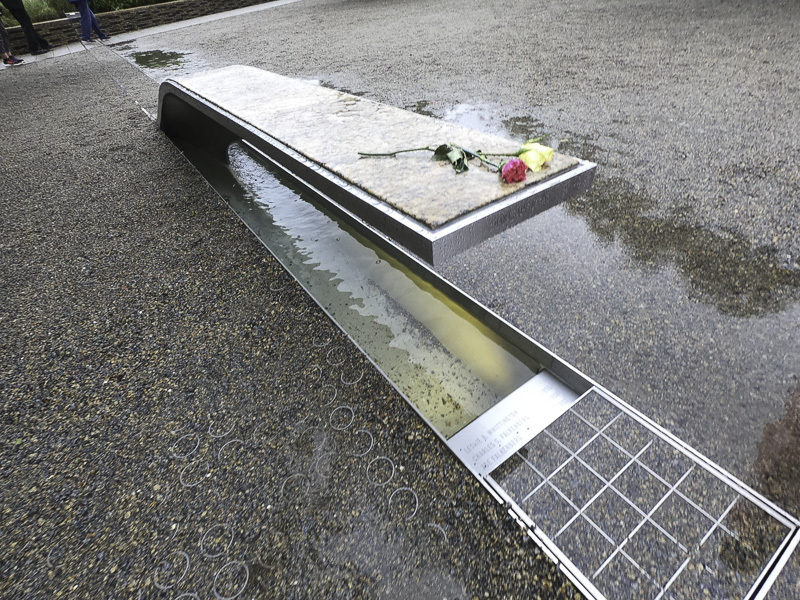 You can follow the stainless steel tracks across the memorial to count how many victims were born in a particular year. It was harrowing. The third day we took a night tour to several memorials including the Jefferson, Lincoln, FDR, MLK, World War II, the Korean War, and the Vietnam War memorials. While we had been to several of those before, those visits had not been at night nor in the rain. Washington looks different at night! Two of the memorials that really struck us were the Korean War Memorial and the FDR Memorial. 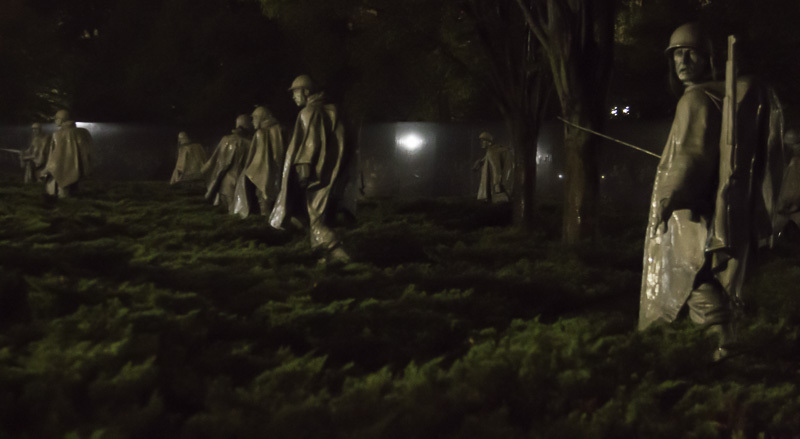 The nineteen statues of soldiers in the Korean War Memorial were all facing in different directions, on guard, each wearing a rain poncho, and some in full combat gear. It was fitting that we visited the memorial at night and in the rain. The statues were surrounded by low shrubs that gave the sense that they were standing in rice patties. It was striking. The bronze statues seemed to come to life. 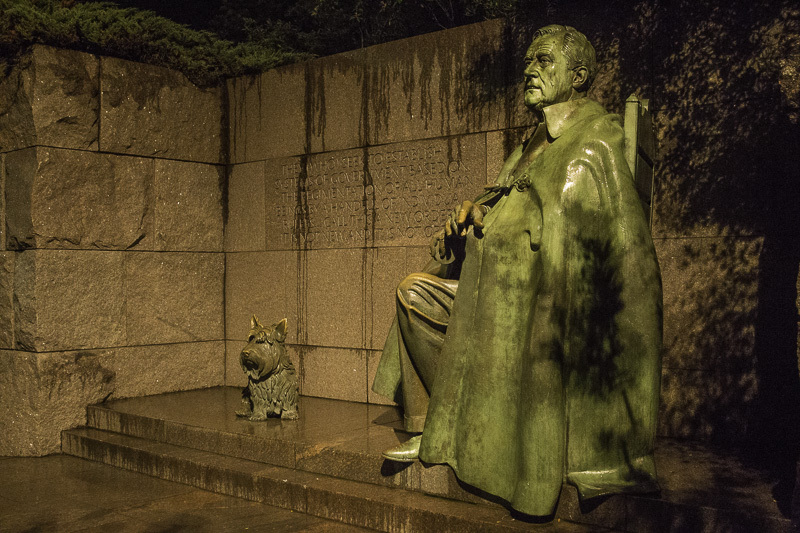 The FDR Memorial was huge—it’s the largest memorial on the National Mall. 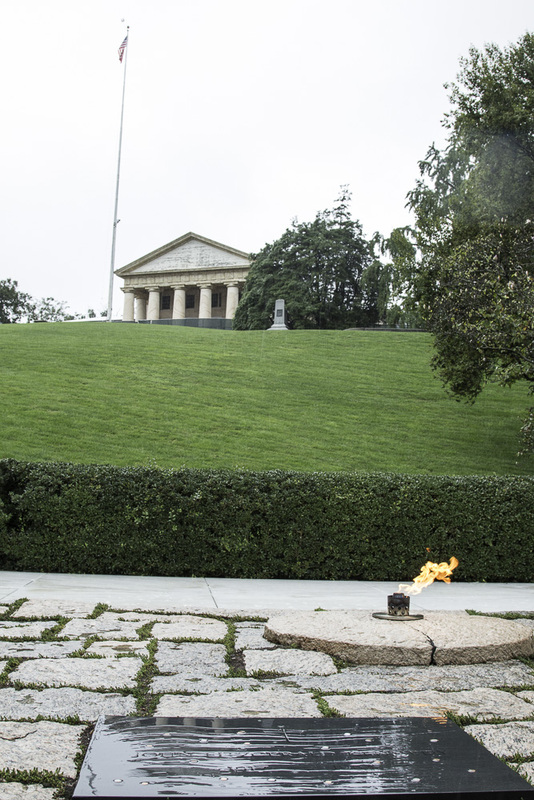 There was a large open air room that depicted each of FDR’s four terms as President. 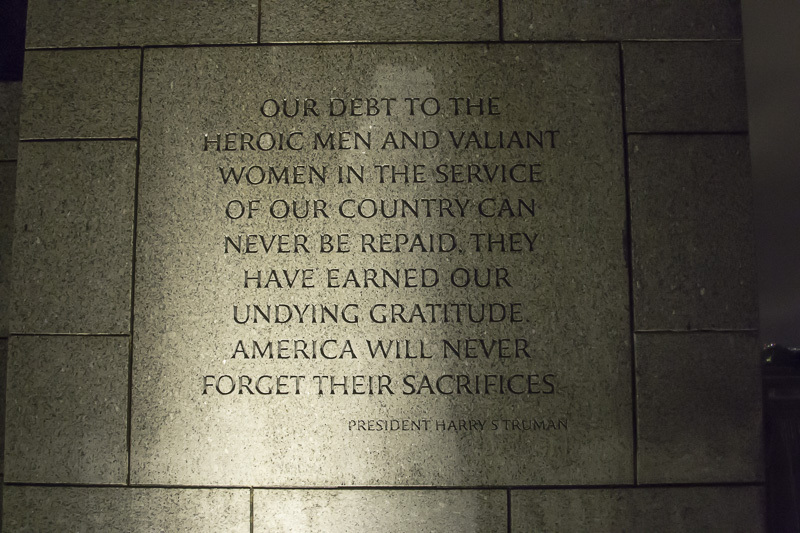 The pathway through the memorial was meandering and featured bronze statues, water installations, stirring wall art, and FDR quotes. Near the end of the walkway was a beautiful statue of First Lady Eleanor Roosevelt. It was hard to take it all in; we’ll certainly visit it again. You can learn more about this monument here. 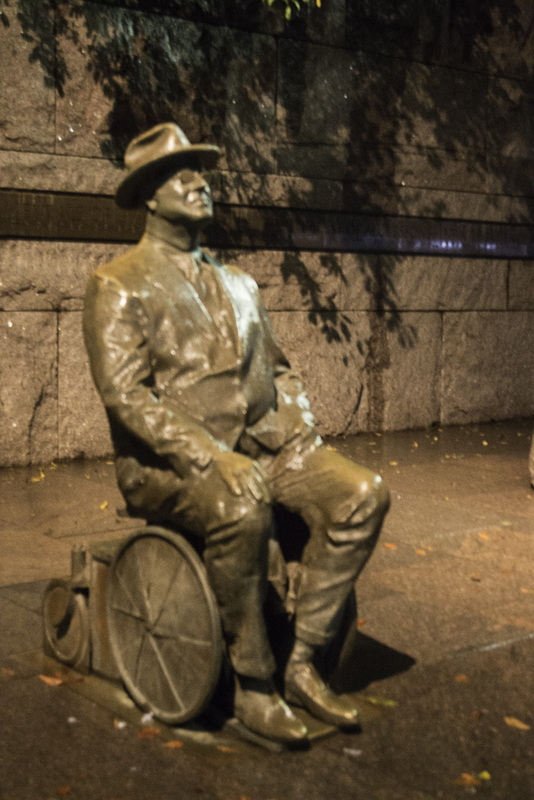 The first statue in the memorial depicts FDR in his wheelchair. FDR was in office during the Great Depression. 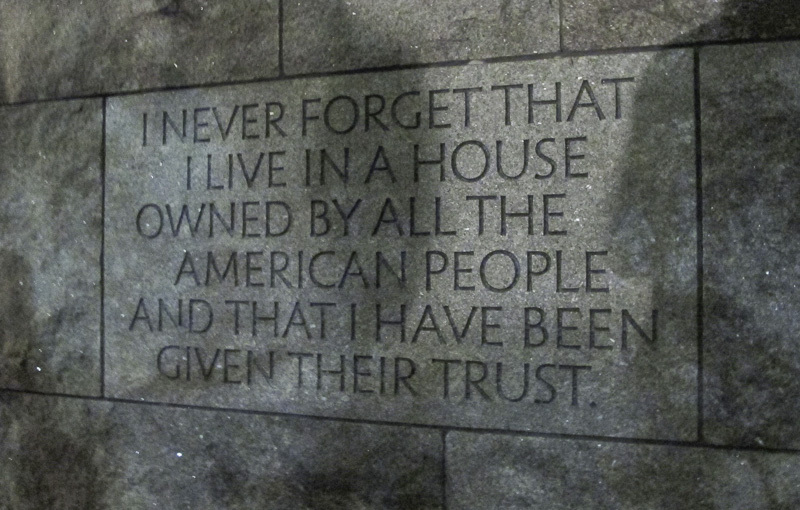 FDR was a man who took his role as President seriously and with great humility. One can see how tired FDR looks during his third term in office. His beloved dog, Fala, was always at his side. 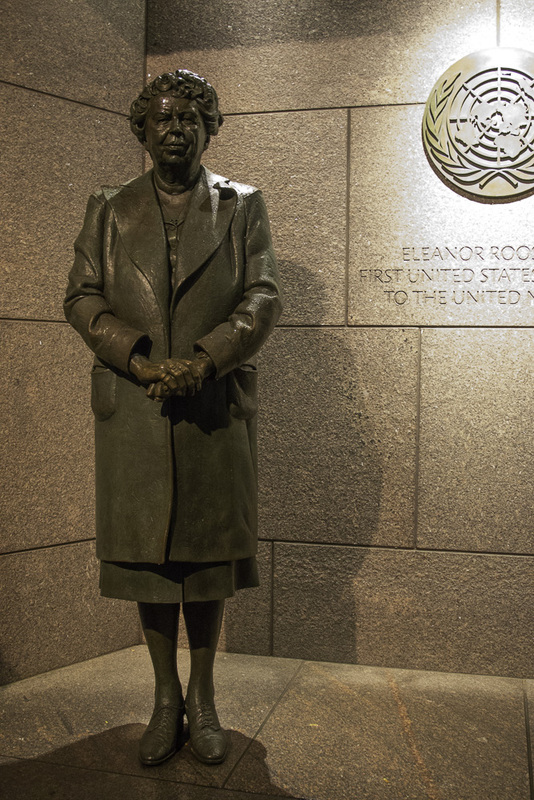 Eleanor Roosevelt, the only First Lady depicted in a presidential memorial in D.C. She was a steadfast adviser to her husband and also served as our first ambassador to the United Nations. 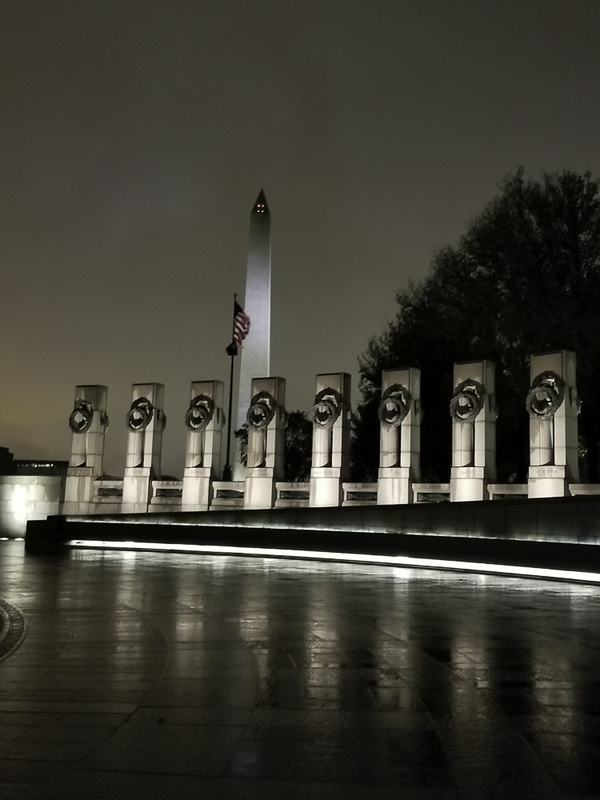 The World War II Memorial was impressive and particularly beautiful lit up at night. Our last day in the city we visited two keystones in the federal government, and then re-visited the Newseum so that Al could see several of the exhibits that wowed Kathe on the first day. We first visited the Capitol, which requires a guided tour unless you contact your Representative or Senator. The guided tour was slightly disappointing to Al. 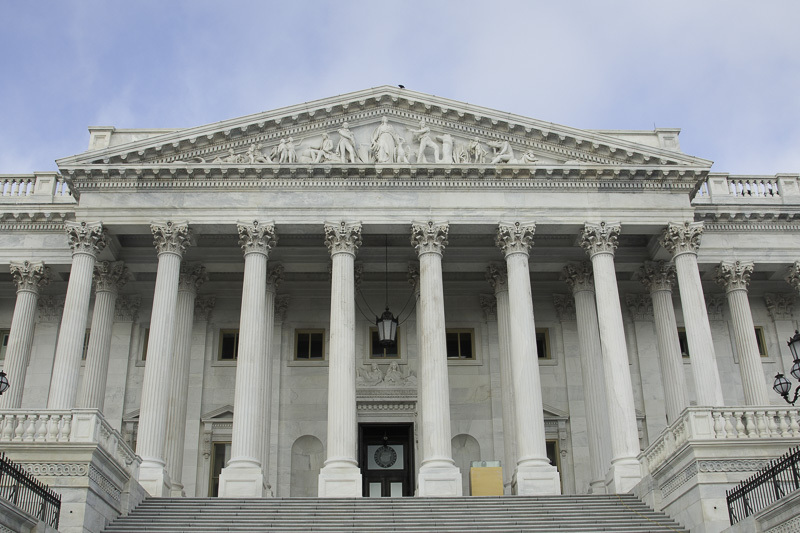 It covers just the crypt below the Rotunda, the Rotunda itself, and the Statuary Hall. All of these were very crowded and we were not allowed to separate at all from the tour group, so that good photography was not possible. Walking past the building you get several views of the Capitol. On the side away from the mall, you pass the main (ceremonial?) entrance to the Senate building, which is a wing added to the original Capitol building. Here is the original Capitol building. Until Reagan, presidents were inaugurated on these stairs. Starting with Reagan, the inaugurations switched to the other side because the crowds could overflow onto the National Mall. 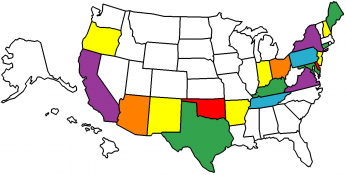 Every state can send two statues depicting important (dead) people from the state. 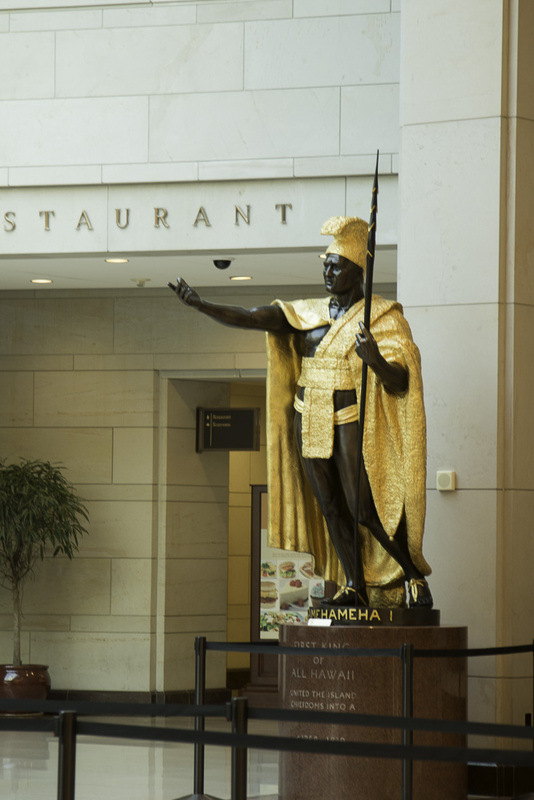 Most are in Statuary Hall, but some are in the main hall of the visitors’ center. Here is King Kamehameha I from Hawaii, the largest of the 100 state statues. After an introductory film, we began the tour in the crypt, just below the Rotunda. The crypt is so named because it was intended to be the burial place for George Washington. Washington’s express wishes in his will were to be buried in his Mount Vernon estate, which eventually were acceded to. In the center of the crypt is a marker which is the geographic center of the original extents of the District of Columbia. If it were not roped off, here you could stand simultaneously in Northeast, Northwest, Southwest, and Southeast DC!. 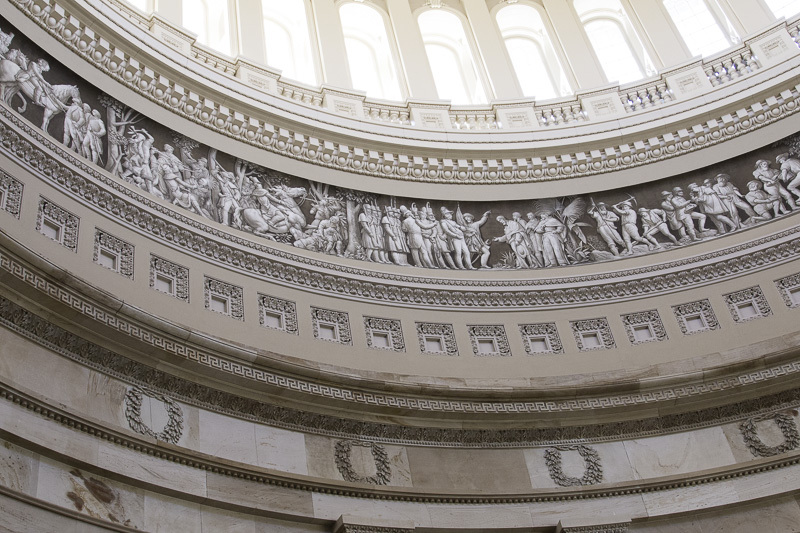 The Rotunda has eight murals depicting historic moments. 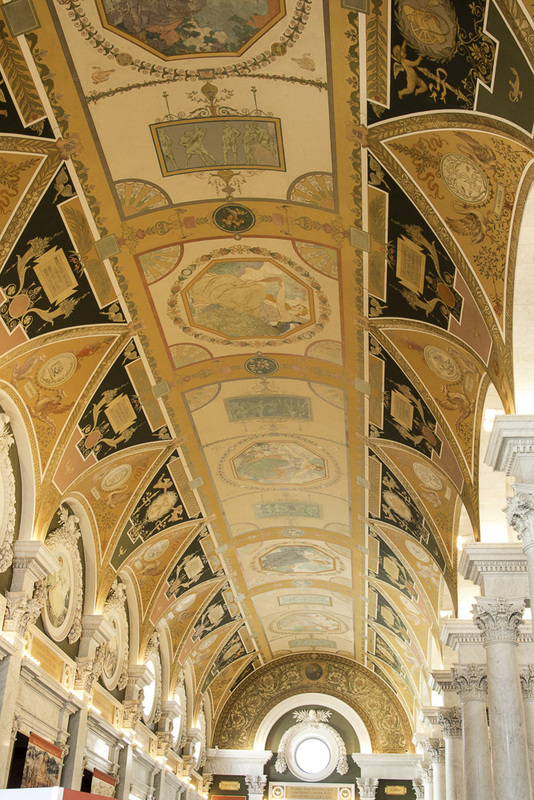 It also has a circular mural around the dome opening showing 400 years of American history. 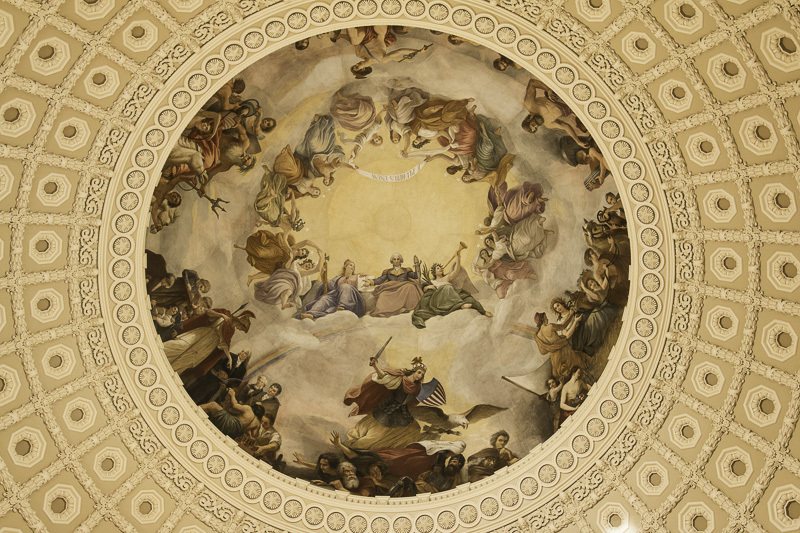 The ceiling of the Rotunda has a painting named “The Apotheosis of Washington.” Apotheosis means to elevate someone to the status of a god. Washington, who twice voluntarily relinquished power, would have hated it. 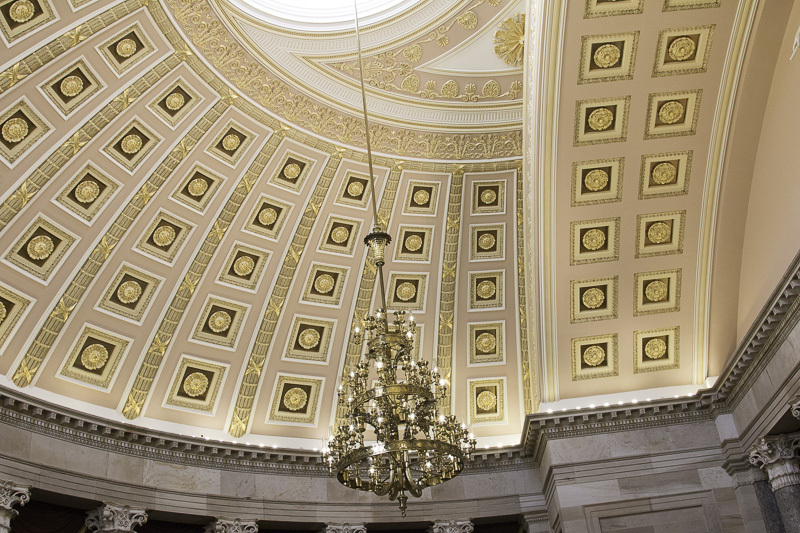 The Statuary Hall was originally the House Chamber until the members could no longer fit, at which point the separate House building was added. The spherical shape of the ceiling caused the room to have terrible acoustics, making it very difficult to conduct business. The solution? 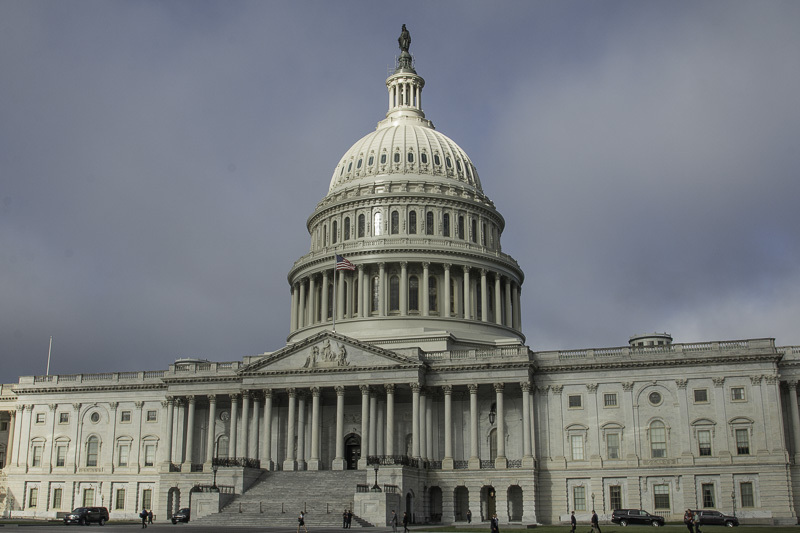 Build a new House chamber! We then walked through the tunnel from the Capitol to the Library of Congress, specifically the original Jefferson building. 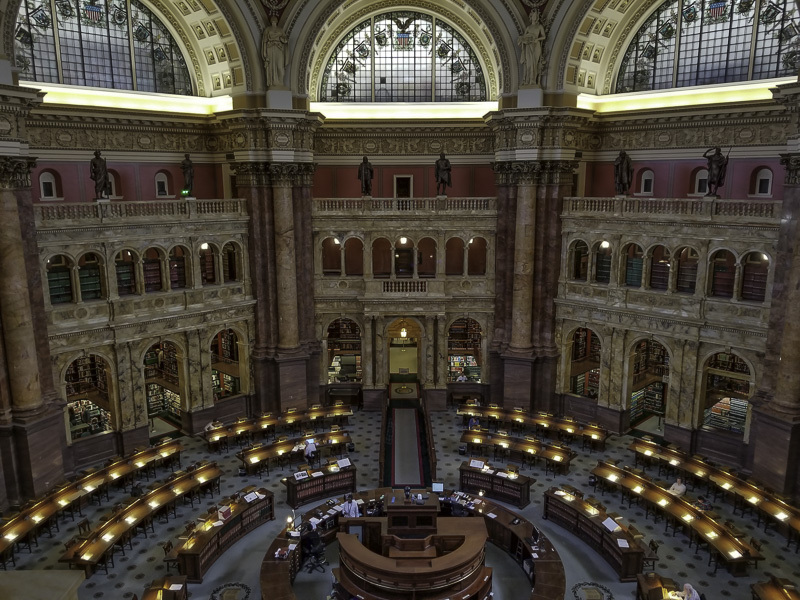 The Library currently comprises four buildings: three adjacent ones in the Capitol district, Jefferson, Adams, and Madison, and one at Fort Meade. 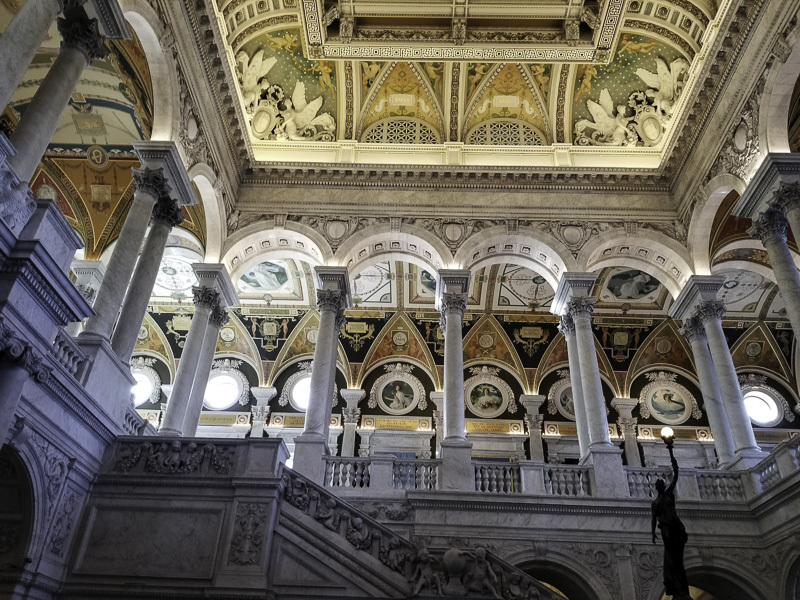 The Jefferson building’s interior is overwhelmingly beautiful. Whereas the Capitol required one to take a guided tour, here we opted for one which was leaving as we emerged from the tunnel. We’re glad that we did. Our tour guide was an older gentleman who was so engaging and knowledgeable. He was overwhelmingly proud to be able to share the LOC with us. His main message to us was that there is no happenstance about ANYTHING in the LOC — every ceiling, wall, mural, stairway, statue, inscription, etc. tells a story about the pursuit of knowledge and the importance of reading and learning. It is an inspirational place and yet one more place in D.C. that you couldn’t possible take in in just one visit. 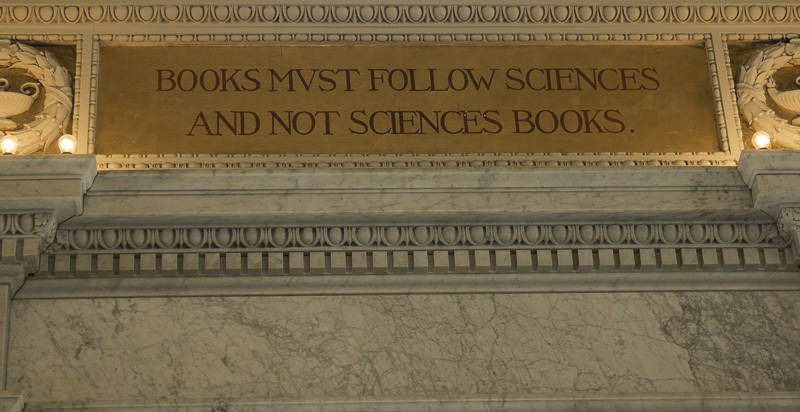 One of many inscriptions throughout the Library of Congress. The main reading room seen from the balcony above. 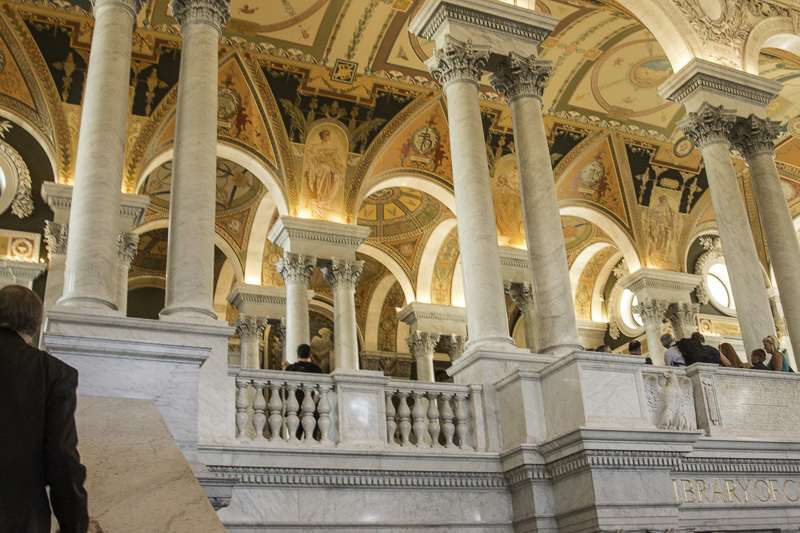 The Library of Congress is the largest library in the world (in terms of its collection), the official research arm of Congress, and also home of the U.S. Copyright Office. It comprises more than 167 million items, and adds 12,000 items to its collection each working day. It is considered our national library. It has more than 838 miles of bookshelves! 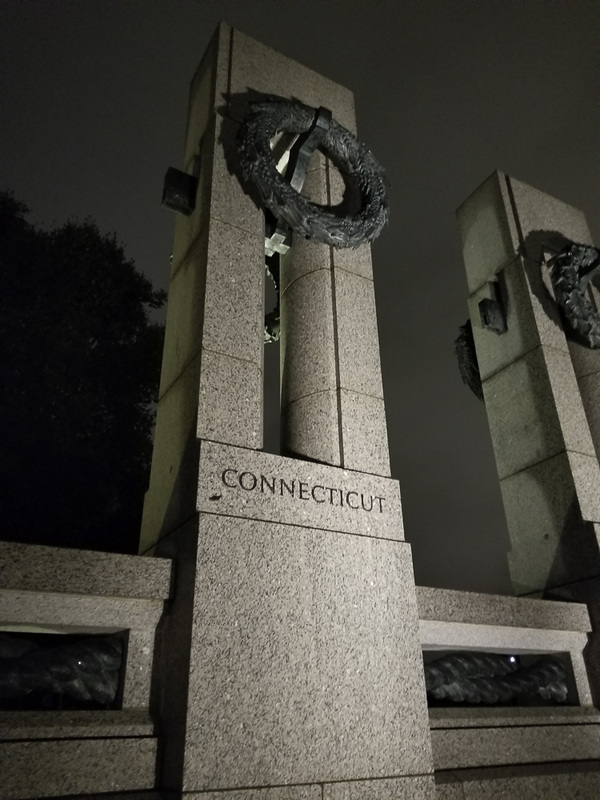 We left our nation’s capital with such a sense of awe and deep reverence and appreciation, especially for those who have served our country in the military and in service to our country. Perhaps it’s being a bit “older” that helped us to appreciate this beautiful city in a humbling way. We will certainly visit again! Previous PostGrandkids! Water!Next PostLet the Wild (Pony) Rumpus Begin! What a remarkable description of your visit to DC! I haven’t been back in over 20 years, and I’m hoping to go soon. Your experiences give me much to include when I do! Your photos and descriptions of all that is there makes me want to plan a vacation around DC. Awesome photos ..
All I can say is “Wow!” Mike and I visited DC for several days with our 5 kids when the oldest 2 were in high school, and the youngest 3 in junior high. After reading about your trip I can say that we definitely have to go back again! !